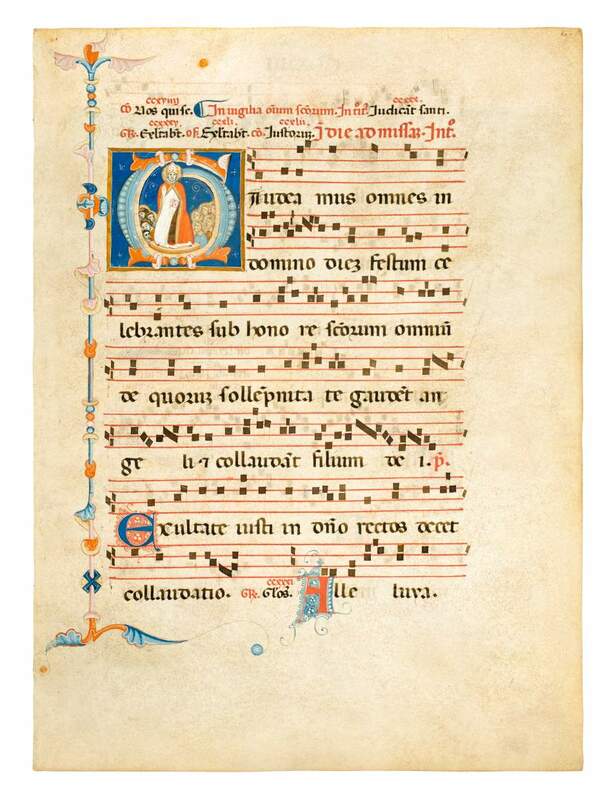 The text and historiated initial G belong to the Proper of Saints in a Gradual, of which two further leaves are known. The initial introduces the introit to the Mass on the feast of All Saints (1 November). The initial G encircles the imposing figure of a Pope, who stands on a pedestal holding a book in one hand and blessing, two groups of saints at his sides with his other hand. The light blue, orange, and pink letter is painted on a dark blue field, with some tracery in white, surrounded by a frame in gold. The extraordinarily fine figure and delicately painted face of the saint shows the expression for which the illuminator, Pacino di Bonaguida, became known. The portraits of the saints (all with haloes) seem to be in various stages: those at the right hand of the Pope are far more detailed than their indistinct counterparts. The illumination is considered an early work of the atelier of Pacino di Bonaguida (active in Florence, 1302-1340), who was to become a leading illuminator and panel painter in Florence.